As my Eat Local Challenge wound down, I thought I would try something a little different: go to a market in Asia before work. Well, not exactly Asia, but an area in downtown Oakland that has a large population of people of Asian descent (some call it “Chinatown,” but I think that “Asiatown” is more accurate, as a large fraction of the businesses are Vietnamese). On Friday mornings, from 8 to noon, the neighborhood has a Certified Farmers’ Market, and it caters to the locals. Tables were piled with bunches of ruffled greens, herbs I had never seen before, packages of bright pink salted eggs, thick bundles of lemongrass, and many other vegetables that don’t appear in Berkeley’s farmers’ market or even the massive vegetable section at Berkeley Bowl. When I saw some pale green ruffled leaves with tendrils, I immediately thought “snow pea shoots”, and I got a little bit excited because they are so delicious. I bought a bunch, a bunch of okra greens, and a bunch of sweet potato leaves, all from a farm in Lodi (57 miles away). Over the next three posts, I’ll explain some of the origin and uses of these unusual greens. A surprise was in store for me. When I started washing the ruffled leaves (the “snow pea shoots”), I was surprised to come across a baby vegetable attached to the stalk. 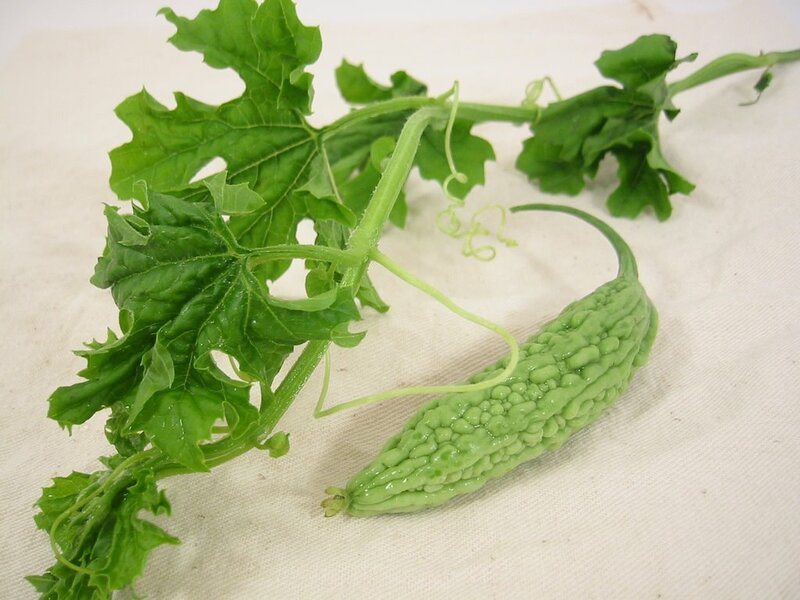 It was a thin, pale green gourd with a deeply wrinkled skin: a baby bitter melon. Uh oh. The bitter melon (Momordica charantia, also called bitter gourd) is popular across much of Asia. It also has some fans in the U.S.–the National Bitter Melon Council, for example, whose motto is “Better Living through Bitter Melon.” According to their web site, the bitter melon has numerous beneficial medicinal properties, including stimulus of hypoglycemic activity (blood sugar lowering) and a possible anti-malarial effect (due to the high level of quinine). Whoever named this vegetable is in absolutely no danger of a charge of false advertising. I have eaten it just twice before (once at home, and once at the New Pardes Bangladeshi restaurant in Los Angeles), and the memories of its bitterness are deeply ingrained in my mind. I don’t think that I want to try it again. In 1982, when I wrote an article about New Mexican food, the test kitchen staff would hardly dare nibble the nasty hot peppers–now an American passion. Bitter melon, like chilli, has a distinct flavor profile and, like the chilli, it seems to create a craving. Once enjoyed (few people chomp Jalapeno happily on the first sampling), the craving is satisfied by nothing else–because nothing else resembles it. So perhaps someday I will be a bitter melon booster. Since the Wikipedia entry said that the leaves were “not particularly bitter,” I decided to use some of my greens in a vegetable soup. In a soup pot, I sauteed diced carrots and onion together, then added some sliced fresh shiitake mushrooms. When the vegetables were cooked, I added a few cups of vegetable stock and a tablespoon or so of soy sauce. About 5 minutes before I was ready to eat, I dropped in two handfuls of the washed leaves. The dark green leaves were beautiful against the background of the broth and vegetable pieces, and I had high hopes for a great soup. But it was not to be. The bitterness of the soup was so intense that I could hardly eat more than a few spoonfuls. Next up: okra greens. Just the leaves. None of the slime. OMG, Marc, you ended up fresh baby karela! You are so lucky!! 😀 When I was growing up, I wouldn’t have thought you were but now I do. This is one of our favorite vegetables. I don’t ever remember eating the leaves but there are so many things you can do with a bitter melon – from plain ol’ slicing and cooking it to stuffing it with ground meat. I couldn’t believe it when Charlie Trotter used thin slices of bitter melon as a garnish on one of his fish entrées. One of the tricks is to immerse it in salty water to get rid of some of the bitter flavor. And it is true, that once you’re hooked to the taste, you’re hooked for life. I was so delighted when you quoted the Wikipedia article, because I wrote those words, and I wrote them precisely with the hope that people would be encouraged to try something new as you did. You can imagine my disappointment and embarassment when it turned out I was wrong! I didn’t just make it up; I wrote that because I had read it somewhere, but being a bad Wikipedian I didn’t provide a reference and now I can’t remember where it came from. My wife says she thinks she’s had the greens and doesn’t remember them being bitter. Maybe different varieties? Different preparation? Your blog is well written and the photographs attractive. This is a great series – I’ve been seeing some of these lately at the farmers markets and wondering what to do with them. You can soak the leaves in slightly salty water for awhile to remove the bitterness. We use those in mung bean soups. The fruit is likewise salted (like you would eggplants) to make it more palatable. Personally, I like a toned down bitterness simply so I can eat more of it. The leaves are also quite bitter. I actually eat the bitter melon by itself as a salad. Sometimes I mix it with a little olive oil and black pepper and some salt. Other times, I pickled thinly sliced bitter melon with apple cider vinegar and it taste great as snacks. This sounds bizarre but sauteeing the leaves with your favorite curry mix can somehow offset the bitterness of the leaves. I find the very tiny melons left on the vines to be satisfyingly crunchy, but yes, bitter.